Can you "DIY" every project around your house? October 10, 2015 Daniel G.
The trend among homeowners these days seems to be toward do-it-yourself home projects. Big retailers such as The Home Depot and Lowe’s often give people the impression that if they just shop there, they can find what they need to do everything from installing in a new sink to building a guest house. Not always true, as many have found out the hard way. So the question is, what projects can you confidently undertake on your own, and what projects are best left to the professionals? Let’s look at a few areas. Painting is like writing a novel: everybody thinks they can do it, but few actually can. Painting the trim around a window or your garage door is one thing, but mounting a full interior or exterior painting project is very much another. 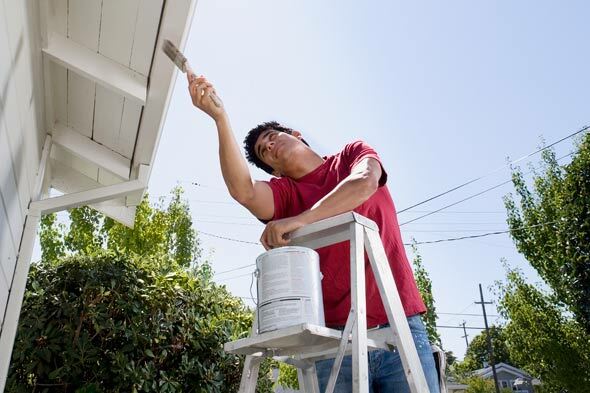 Still, by doing a little research and preparation, homeowners can turn out a good result with most painting projects. If you’re looking for perfection, however, professional painters are your best answer. This is especially true if you’re not comfortable with sprayers and other equipment and if areas that need painting are particularly high off the ground. Have you ever been shocked by electricity while doing something with it you didn’t know how to do? Electricity is nothing to play with, and unless you have a solid knowledge of this stuff and are a very careful worker, there could be a big shock in your future if you try to tweak the electricity in your home. Simple change-outs of switches or plugs should pose no major problem for the uninitiated (turn off electricity before starting work! ), but unless you really know electricity, it’s probably best to hire an electrician for large, involved projects. The term “plumbing” covers a huge range of disciplines, some of which most people can do by themselves, others of which only a licensed plumber should attempt. Need a new float in the toilet? Go for it. Leaky faucet needs washers? No problem. Sewer line’s backed up, the basement’s flooded and you can’t find the dog? Call a plumber fast. Like the Roto-Rooter jingle, “. . . and away go troubles down the drain,” a good plumber can make problems disappear. For the homeowner, attempting a plumbing job that’s too difficult likely will mean that money, not troubles, will go down the drain. Under ideal circumstances, the average homeowner can lay down some new tile in a kitchen or bathroom and turn out a nice finished product. But what if the room’s right angles aren’t quite right? What if the floor is uneven? What if it takes you the whole weekend? Simple flooring jobs can often be undertaken by novices – between guidelines in the tile boxes and info on the Internet, most of what you need to know is readily available. But remember, a flooring professional still knows more than you. Normally renovation projects involve removing something and then adding something in its place. If your renovation project calls for removing a small wall to open up a room, you’re probably well-equipped to do that. Unless there’s a lot of wiring in the wall. Or unless the wall is acting as a ceiling support. In these and other cases, it can get tricky. This doesn’t mean you can’t do it yourself, it just means you’d better go into the project prepared with the right answers to handle a variety of potential problems. For sizeable renovation jobs, only professionals have the knowledge, skill and experience to properly destroy and rebuild. The point of all this is this: When undertaking any home repair or remodeling project, ask yourself if you’re truly prepared to see it through to an acceptable completion. If the answer is yes, give it your best. If the answer is no, get on the phone.